No event is too large or too small. We DJ, emcee, and light ALL EVENTS, including ... Weddings, College Parties, Christmas Parties, Sweet 16 Parties, Clubs, Corporate Events, Charity Events, Proms, Clubs, and so much more! R Lawrence DJ is the premiere DJ in Pennsylvania, Maryland, D.C., and Virginia, providing all the best music, lighting, and hosting for every event. As the owner of R Lawrence DJ, I have been personally involved with hundreds of weddings over the prior 14 years. We offer it all, and we make it easy! With R Lawrence DJ, we provide the best music, emcee for your event, multiple sound systems as you need, wireless mics, and lighting, including for your dance floor. For weddings, we offer an easy ALL-INCLUSIVE WEDDING PACKAGE that includes everything you want and need for your wedding at a great price! 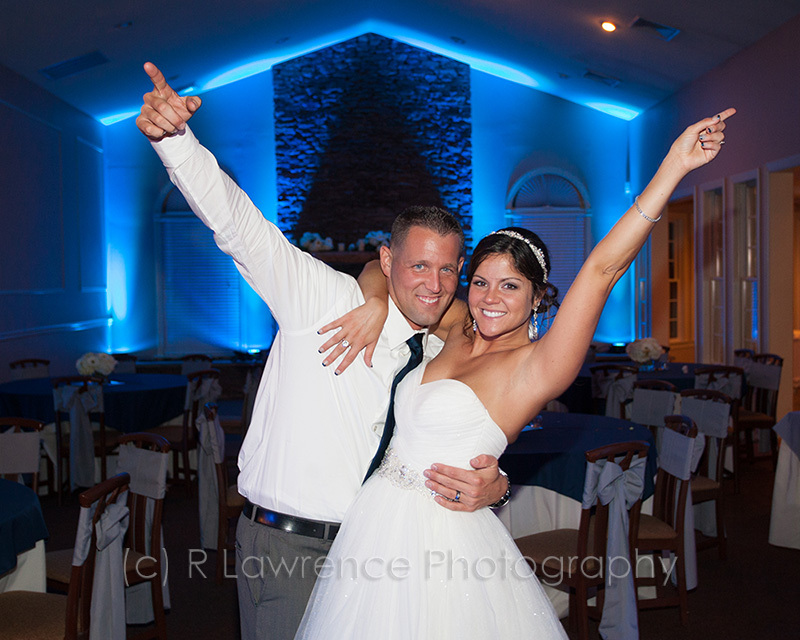 When you choose R Lawrence DJ, you receive FREE dance floor lighting! Lights pulsate to the music, giving your dance floor a party-like feel that everyone loves! Additionally, we can incorporate our very own "Starry Night" on the ceiling of your dance floor, inside an outdoor tent, a bar (as shown below), or other room you want to accent. Starry night displays an ever-changing blue "cloud" on the ceiling, as well as thousands of pin-sized lights, slowly moving across the ceiling for a "starry-night effect". Not only can your guests talk to us in person for songs they want to hear, but by the power of being connected, they can also communicate directly with your DJ via text message! Ask us about our "Text To Request tree"! We have a vast library of music available at our finger tips, from the top club hits of today, including Cardi B, Shawn Mendes, and Bruno Mars, through all the hits of yesterday. We work very closely with you in the planning phase to play the perfect music at your event, at the right time, whether it's pop, dance, club, country, or rock. The digital era means we have literally an unlimited number of songs in every genre at our fingertips. Not only do we have a huge collection of the best music, but since we are 100% digital and are connected at all times, we have access to virtually every song ever known to man. That means that real-time requests for any song can be accessed and played during your event. We use only the best DJ equipment around ... from the speakers, mixers, mic's, and everything in between. We have two separate sound systems -- a main system for wedding receptions, and a satellite system for outdoor wedding ceremonies. We also provide multiple wireless mic's, perfect for wedding toasts and the blessing, as well as a wireless lavalier mic for the officiant. Your videographer will love us too, as they can "plug in" to the audio from your event for the best audio quality. The best news: there are no extra or hidden costs to use both sound systems at your event. It's all included in our best price to you! THE SINGLE BEST WAY TO TAKE YOUR VENUE OVER THE TOP IS TO ADD IN OUR UPLIGHTING. Uplighting is the process of strategically placing small, canister LED lights throughout your venue, and shine the color of your choice up on the walls. We place them in the corners, along the walls, and on anything you want to accentuate, such as fireplaces, bars, or architectural designs. We use up to 20 uplights per venue as needed. And does it make it difference in your photos with uplighting in the background? Absolutely Yes! When your guests see it, they will simply say, "WOW"! More importantly, share YOUR playlist with us for your music preferences and SONG selections! Thank you for your email! We will get back to you very shortly!